Rodrigo F. Fadini. Ana Mellado, and, Leidielly P. Ghizoni. 2014. A Host Creates an Enemy-free Space for Mistletoes by Reducing Seed Predation Caused by a Woodboring Beetle: A Hypothesis. 46(3): 260-263. Parasitic plants rely on host plants for nutrition. The number of host species varies largely between groups, from single species or genus to hundreds of species. Relative abundance of the host and evolutionary history are the main requisites for parasitic plants to develop specificity to abundant hosts. In the present study, we suggest a novel mechanism by which a hemiparasitic mistletoe can develop local specificity mediated by its host. First, we describe a novel interaction in which a woodboring beetle (Hypothenemus obscurus) preys on mistletoe seeds (Psittacanthus plagiophyllus) attached to tree branches. This beetle preys more frequently on seeds deposited on branches of non-host species than on branches of its unique local host species (53 percent on average vs. 26 percent respectively). We hypothesize that local host specificity for this mistletoe could be partly mediated by beetle-host incompatibility, since the host offers a predation-free space in which mistletoes have better chances to grow. Furthermore, that the exceptional gum exudates produced by this unique host species minimize beetle attacks on branches, thus reducing predation of mistletoe seeds. This novel tritrophic interaction opens an avenue for research on macroscopic host-specificity mechanisms that occur at the level of the host bark and that have been poorly studied by plant ecologists. For more information, visit Rodrigo Fadini’s Lab Page and Google Scholar Profile and Ana Mellado’s Institutional Page at the Universidad de Granada. Panoramic view of savannas and forests near to our study site. (Photo credit: Edson Varga Lopes). Fig. 2. 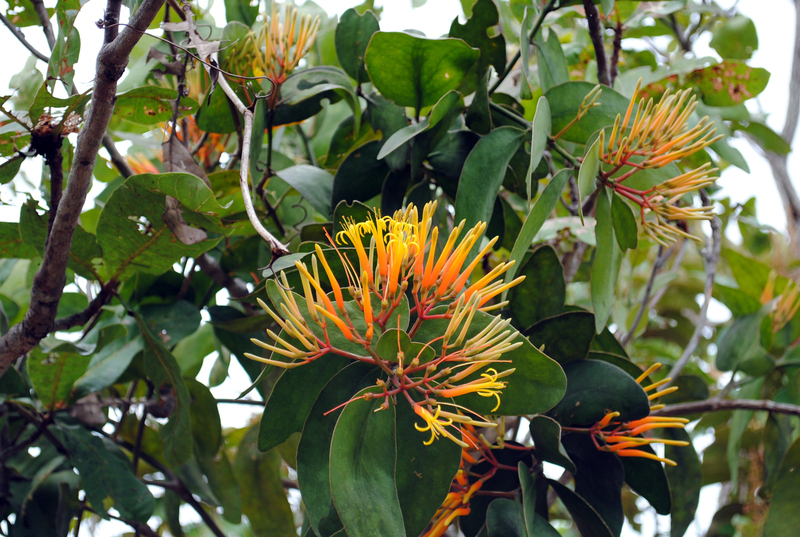 Inflorescences of Psittacanthus plagiophyllus. (Photo credit: Rodrigo Fadini). Fig. 3. 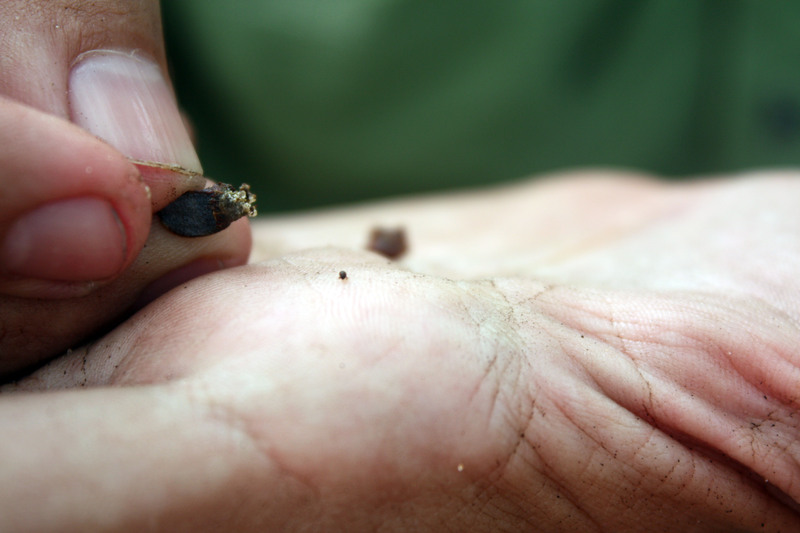 The beetle Hypothenemus obscurus (right) removed from a seed of P. plagiophyllus (left). (Photo credit: Ana Mellado). Fig. 4. 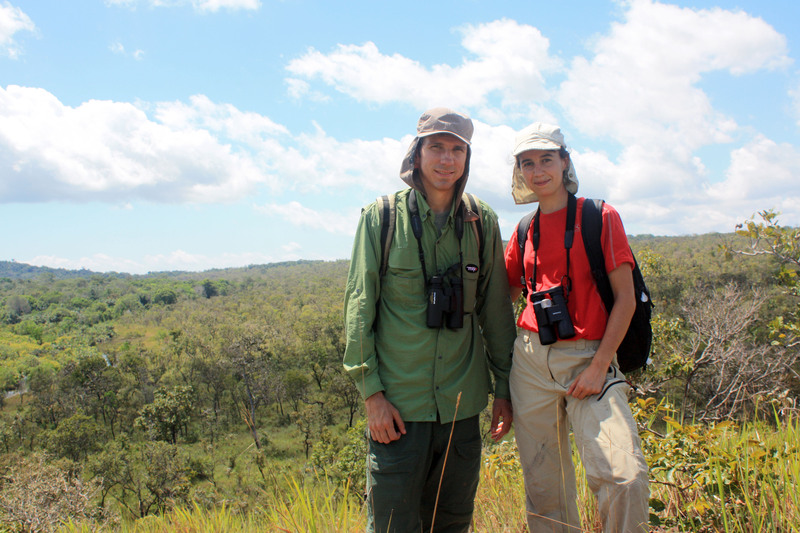 Rodrigo Fadini and Ana Mellado pose for a photo near your study area. (Photo credit: Arlison Castro). Fig. 5. 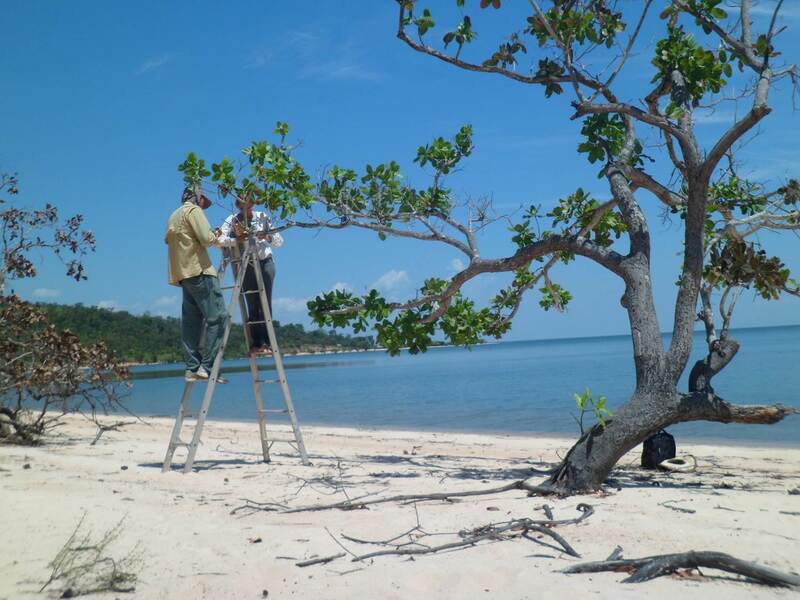 Rodrigo Fadini and Leidielly Ghizoni doing fieldwork in a sand beach along the Tapajos River. (Photo credit: Brendson Brito).